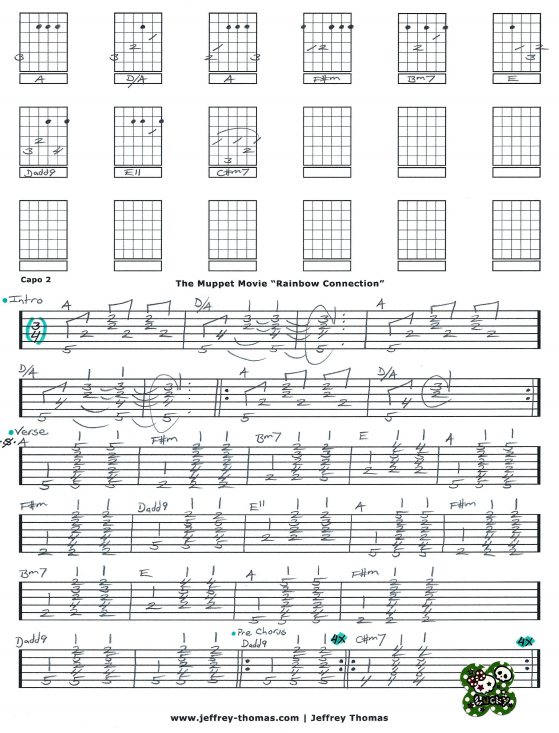 Rainbow Connection free guitar tab from The Muppet Movie! Learn to play Kermit’s ballad on guitar with my custom tab arrangement. I am following the banjo track from the original recording and decided it would be best to capo at the second fret. I have kept it in the original key so it will match up perfectly with the recording. There is a 1/2 step modulation in this song from A to Bb that I did not include. This tune is a popular request from my guitar students and I am glad to have it in my archive. Want the full guitar tab for free? Send in your email address on the form provided. Need help playing this song? Fill out the Schedule A Free Lesson form to set up your free Skype guitar lesson today. Learn this song from The Muppet Movie on guitar! “Rainbow Connection” reached #25 on Billboard’s Hot 100 in 1979. Enjoy more online guitar lessons on my tab, video and blog pages.